I can’t sleep on planes. I try occasionally and manage to lightly nap at best. It’s not so bad on short flights but it also happened when we went to Europe last year. XD Needless to say I was very tired by the time we got to the hotel. I concur. I can’t sleep on planes either. I can kind of weirdly curl up in my seat in a fetal position and then sleep sometimes. I should have thought of this for this trip, but sometimes I’ll put the table thing down and then put a pillow on it and then sleep while kind of sitting normally. but Errol, you should be relieved that Debs feels so secure around you to drool on you, next thing she’ll fart around you. Are you sure you weren’t a married old couple in a past life? 😀 ps if either of you twitch when reading this, I win! * Laughs * Hey, a drooling Debs is better than a crabby, horribly sleep deprived one. Nobody wants that, especially not Errol when he’s stuck with me for an entire weekend so sacrifices must be made. Intellectually, I understand…. but there is this part of me staring at you all wide eyed, wondering why in the Goddess’ name you’d WANT to sleep on an airplane. To me, flying is one of the most amazing things. Airplanes are my roller coasters. I LOVE take off and landings, and turbulence makes me giddy. Best flight I ever had was the first time I flew alone (without my family, it was a commercial plane and I’m sure there were other people around, though I don’t recall them), we flew through an AMAZING thunderstorm. It was AWESOME. The lighting was this amazing deep electric purple that hit the wings and lingered, dancing across the surface before fading back. I want to fly through something like that again. And I spoke to someone who has been in the cockpit during a storm like that, I want to see it from that view. He says it’s like washes of electric fire across the front. So yeah…. to me sleeping on a plane is like sleeping on a ‘coaster would be to someone who loved them. Waiting on line for hours, just to sleep through the best part? And I needed to write! I actually didn’t sleep on the way down. I was with you during a storm on a plane though not sure it’s the one you’re thinking of. And the only time I ever wanted to sleep on planes is when it’s a long trip… like across the country or to a different one. You’re up god awful early and then dealing with time changes. 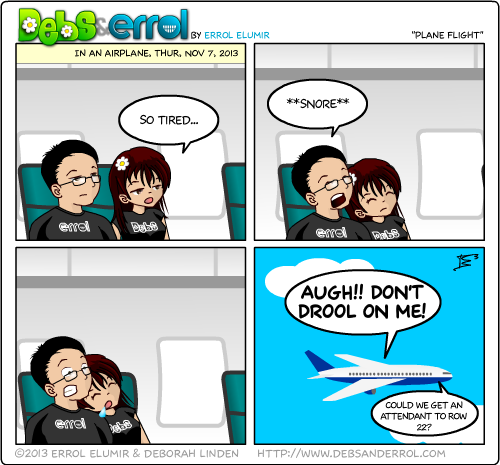 XD Well that and flying is more of an eh ‘can we get there faster’ thing so yeah. Not then, lol. When I graduated JHS, I flew on my own to visit my grandmother out of state. It was a tradition she had with all her grand kids. That was the trip where the following phone call took place.